"The Tour has always been a story about men, great ones... and lesser ones". Before you read the rest of this blog post, take a guess, who do you think was the best sprinter of the past generation? Cipollini, McEwen, O'Grady, Freire, Zabel, or Petacchi? (I am considering Boonen, Hushovd, Farrar, Haedo, Greipel, and Cavendish as current generation). Erik Zabel is considered one of the best sprinters of all time, and possibly one of the best riders of his generation. 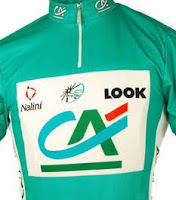 Zabel won the (green) points jersey 6 consecutive years at the Tour de France and 3 years at the Vuelta a Espana. He won the Amstel-Gold in 2000, the UCI Road World Cup in 2000, and the Milano-San Remo 4 times. He won the German Road National Championship twice, and the silver medal at the Road World Championship twice. 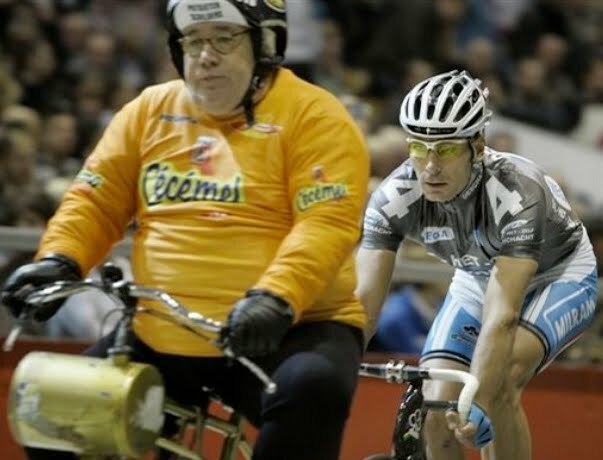 He totaled 212 wins as a professional cyclist. Born in 1970 in East Berlin, Zabel rode for 11 years for Team Telekom, 2 years for T-Mobile, and 2 years for Milram. I wanted to know: Who was the best sprinter of the past generation? Comparison of wins for Erik Zabel, Oscar Freire, Mario Cipollini, Robbie McEwen, Stuart O'Grady, and Alessandro Petacchi. The world Champion jersey eluded Zabel, whereas Freire won it three times, although Zabel had more major wins than any other sprinter. I would say it is a close call between Erik Zabel and Oscar Freire (who is still racing). Although if you ask any cyclist, they will likely say - Mario Cipollini! A wonderful shot of my sister-in-law Suz and Erik Zabel in France in 2008. Zabel is featured prominently in the 2003 movie Hell on Wheels, where his legendary friendship with Rolf Aldag is obvious. Erik Zabel and Rolf Aldag became friends as young riders and together rode for 13 years on Telekom/T-Mobile from 1993-2005. Theirs remains one of the greatest friendship in the history of the sport. In 2007 after a former Masseur on Team Telekom published a book alleging doping in the team, Rolf Aldag decided to admit to doping. Erik Zabel stood by his friend's side and admitted that he too had experimented with EPO in preparation for the 1996 Tour de France. They admitted it was short term, and apologized. Their retirement had already been planned. He also later admitted to causing a crash in the peloton in stage 2 of the 2007 TDF. A tarnished end to an amazing career in cycling. At the age of 38 Erik Zabel retired in Germany in October 2008, "I was like in a trance today. For two years I planned to step off the bike at the 100th anniversary of the Berlin six-days. You should quit when things are going great". Today Erik Zabel contributes as a member of the UCI ProTour Council (UPTC), and has worked with upcoming sprinters such as HTC Colombia hopeful Andre Greipel.